The book starts way back when Paul and Gene first meet. The first group they were in- Wicked Lester, then the formation of KISS. The influence of groups like "The Brats" and "The New York Dolls" on them. Slowly we work our way up to the release of KISS ALIVE!, and the hit song "Rock and Roll All Night". For many diehard KISS fans that have read everything they could get their hands on, this book might be just a rehash of the same old, same old. 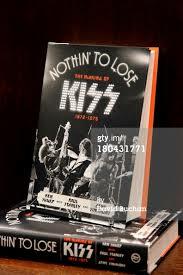 But, although I was a KISS fan from way back, I didn't read any books about the band before this one. So, for me this book was like a trip down memory lane. It had the feel of a group of guys and gals sitting around talking about the good ole days. This book wasn't really written in the dry biography fashion so many performance arts books are written in. The majority of the book was a collage of interviews and stories from the people that lived through that time with the band. The roadies, the managers, the promoters, the opening acts, the bands the group opened for, the road experience, the first recording contract, the issues with the label, the slow process of making it in the music business is all covered. KISS was a very hard working band. Their makeup and costumes worked for them with the fans that were blown away by the live shows, but worked against them when it came to getting air play on the radio. People didn't know what to make of them. There was also the criticism of other musicians that felt that the group's outrageous stage show and the entertainment first attitude was putting music way down the list. 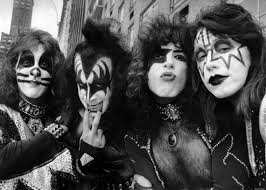 KISS was never thought of as a band that broke ground musically. In my opinion though I thought their music was no worse, (or better) than other hard rock type music you heard in the seventies. KISS was a group that was needed for that time. The sixties and the seriousness of the lyrics in music, such as war and violence etc. was beginning to lose it's passion and people were ready to kick off the social conscience of the times and party a little bit. KISS was perfect for that. Sometimes people just want to have a good time and see a show and be entertained. There are lots of groups and singers etc. that are more focused on the music and when we want that we will buy that music or go to those concerts. KISS put on one hell of a good show. Early on they realized the fans were what it would be about for them. The music industry has never acknowledged KISS in that way. Sort of like the Academy Awards will never give a blockbuster action movie that raked in millions at the box office, a nomination for an award. But, there has never been a band like this one before or since. My favorite story in the book was about the visit to Cadillac High School. The writing wasn't really "writing" if you will, since it was a mainly a collection of stories from people involved with the group. Most of the stories were told by Gene and Paul and I guess that's way their names are on the cover as co-authors. (They didn't really write anything, but they were obviously the main contributors)I also enjoyed the stories about the group Rush and the help KISS gave the group in terms of how things should work on the road and so forth. There were also some really good pictures in here as well. Old photos of the band from way back and other bits of nostalgia. I found the book entertaining and for me many of these stories were new. I have read some reviews of this book that stated this was nothing new to them. But, if you are that big of a fan, you may want to at least give the book a try since so many of these stories are told by the actual people who were there. These are actual quotes and told in first person. The book is rather long and there were times when I had to put it down and read something else for a while. I think some things could have been edited out without compromising anything, but I think all the stories were chosen for a reason by either the main author or the members of the band. Overall I give this one an A. Thanks to the publisher and Edelweiss for the DRC of this book.